Contains some (fairly old) Game of Thrones spoilers. LONDON — Remember how crushingly sad you were when Ygritte died, and her and Jon Snow's all-too-brief romance was brought to a blunt, painful end? Well, dry those eyes. 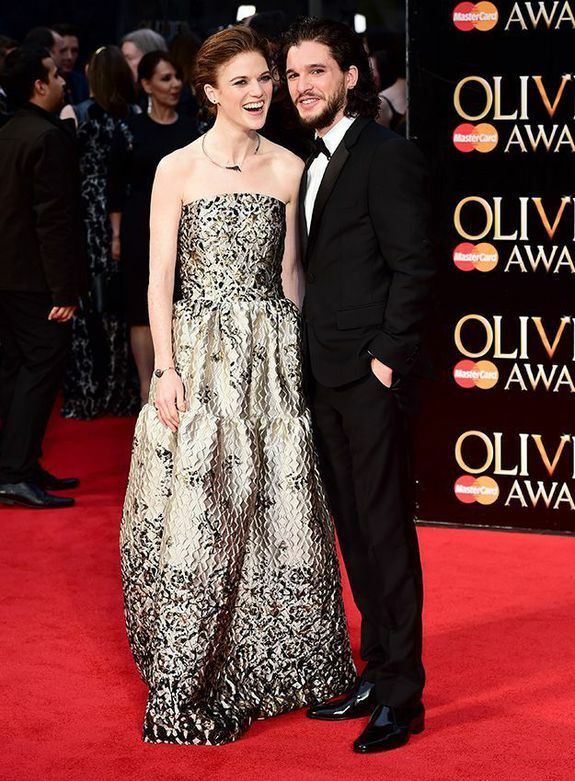 Kit Harington and Rose Leslie, who were photographed together earlier in the year, hit the red carpet at Sunday's Olivier Awards in London as an official couple, proving the universe isn't quite as nightmarishly tragic as George R. R. Martin would have us believe. Since they were pictured together back in 2012 there have been rumours about Harington and Leslie's relationship — apparently they split up in 2013, but there have been conflicting reports since of them getting back together on-and-off — but now there's no doubt; Jon Snow and Ygritte have been re-united at last. Looks like death doesn't have to be the end after all, right Jon? SAN DIEGO, CA - JULY 24: Kit Harington, Nikolaj Coster-Waldau, Maisie Williams, Natalie Dormer, Sophie Turner, Gwendoline Christie, Rory McCann, Rose Leslie, Pedro Pascal, and John Bradley-West from the cast 'Game of Thrones' pose for a portrait at the TV Guide portrait studio at San Diego Comic Con for TV Guide Magazine on July 24, 2014 in San Diego, California.